Thanks to the Lego generation growing into full grown adults, Lego has found its way into creating fully functional electronics that kids and grown ups can enjoy. This MP3 player is one of the many Lego themed electronics spotted. This one will allow for your music to be played. Plus unlike many of the normal MP3 players out there, this one has an LCD screen to view upcoming songs on. The 2GB MP3 player will hold up to 500 songs, which should be enough to keep you happy for a little while at least. It’ll also play continuously for 8 hours before it dies. In order to power it up again, you’ll just need to hook it up to the USB port of your computer. It also has the typical 3.5mm headphone jack. 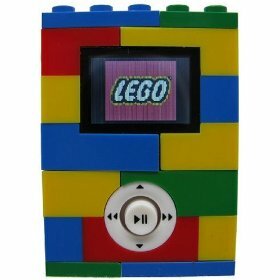 The biggest feature on this MP3 player is that you can add real Legos to both the top and the bottom. You can purchase it through Amazon for $29.99.